It was the first Saturday of 2018 and Kristian Robinson was out to make an impression. He'd signed with the D-backs out of the Bahamas six months earlier, but had yet to make his professional debut. Fellow countrymen Todd Isaacs and Lucius Fox organized a Home Run Derby on Jan. 6, in part to promote their sports apparel brand Don't Blink, but more importantly to promote baseball in their nation. On Montagu Beach in Nassau,15 participants took 20 swings trying to hit "home runs" past specified targets in the bay. Those are 20 chances to show some power, and for Robinson, 20 chances to show he was capable of hanging with established Minor Leaguers like Fox, Jazz Chisholm, Anfernee Seymour and Nick Gordon. He hit seven into the sea. No one before him hit more than five. In a tournament style, he just needed his opponent to hit fewer than that to survive to the next round. That opponent happened to be the current No. 11 prospect in baseball -- Bo Bichette. The Blue Jays shortstop deposited eight balls into the water, eliminating Robinson en route to winning the whole thing with nine in the final round. (He repeated his title in 2019.) Only fellow finalists Gordon and Fox matched Robinson's total of seven in a single round the rest of the way. "That was rough, man. That was rough," can be overheard on the loudspeakers in the YouTube video of the event shortly after Bichette's walkoff. "I tell everyone that story," Robinson said. "I was so pumped that I didn't even watch Bo's round. I went to the tent to get ready for the next round, and when I came back, they told me I lost. I was like, 'What?' I didn't even know about Bo until then, but I've been following him ever since." And now the rest of the baseball world should start following Robinson. As the right-handed slugger showed that day, he has the talent to stand out beyond his native shores. If that display of power was possible then, what's possible now? And what's possible for the future? A huge teenager at 6-foot-3, 190 pounds, Robinson was ranked as the No. 16 international prospect going into the 2017-18 signing period. He had the size and bat speed to make scouts envision the day when he'd be a plus power hitter. He already had plus speed and came from an impressive family. His grand uncle, Thomas Robinson, was a four-time Olympian sprinter for whom a major track and soccer stadium in Nassau was named. The D-backs, who signed Chisholm out of the Bahamas in July 2015 for just $200,000, dipped much deeper into their wallets to bring the outfielder on board for $2.5 million. With the Giants also investing $6 million in Fox in 2015, it was clear Bahamian baseball was on the map -- a notable achievement for a country that so far has Antoan Richardson as its lone Major Leaguer in this millennium. "I feel like when Jazz and Lucius, when that class signed, that really hit everyone in the Bahamas, just seeing how much recognition we were getting from another country in their sport," Robinson said. "That class signing was a big hit, and then, it's been a steady improvement from there. I want to say my class with [Angels prospects] D'Shawn Knowles and Trent Deveaux, that was another big hit. It's only going to climb from there." But it's one thing to sign for seven figures, another to go deep in an exhibition at home and yet another entirely to back up the hype in pro ball. Having turned 17 in December 2017, Robinson was an untested player when he headed into his first Spring Training this time last year. It didn't help that he suffered a shoulder injury that kept him from showing what he was capable of immediately, but the plan was always for the outfielder to open the season in extended spring camp anyway. There was a plan beyond that as well; the D-backs had been open with Robinson about their intention to send him to the Dominican Summer League for his first taste of the Minors. That's a typical route for a player signed internationally, though it's a path usually intended for Spanish-speaking players who can ease into the rigors of the profession in a land that speaks their language (and for many is also home already). That didn't keep Robinson from displaying his tools on the backfields in extended. With his size, he was physically imposing in comparison to his fellow teenagers. His power, run, arm and glove all showed above-average potential, making it clear to the D-backs that they couldn't send him away. Not to the Dominican Republic anyway. The organization was going to keep Robinson in the Grand Canyon State in the Arizona League, perhaps one year ahead of schedule. "I got a phone call from [assistant director of pro scouting Josh Barfield]," Robinson said, "and I just remember that same week, we were supposed to get our flight information to go to the DR and mine never came through. One of my teammates, his flight information came through, so I was wondering what was going on. That's when I got the call. I think I was a little excited, but I think a couple of my teammates and my girlfriend were even more excited. "I think the biggest thing to help me in staying stateside was not thinking I was staying stateside. To be honest, the first meeting I had with the guys, they told me where I expected to be at the end of the year, and I stuck with that. I didn't put my expectations any higher. Am I wrong for doing that? I'm not sure. But I kind of stuck with the fact that I was going to be in the DR for my first year. I played with no intentions of trying to question or negotiate with that decision that was made. That helped me to not think about anything when I was playing." When the Rookie ball season started, it didn't take long for Robinson to show he belonged in the Arizona League D-backs lineup. Batting third and starting in center field, he singled in the first official at-bat and stole his first base shortly after. He finished 3-for-5 with two runs scored and an RBI in a 7-0 rout against a Cubs affiliate. "I remember thinking that day, 'These guys are no different than what I've been facing [in extended],'" Robinson said. "That just kind of set the mood." 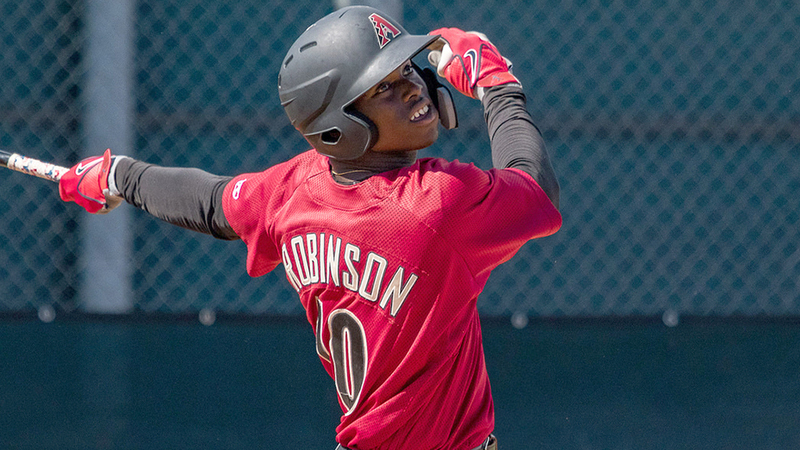 While his skills helped Robinson feel at ease in Arizona, he also benefited from some knowledge of the culture that many international prospects don't have right away. For one, he knew the language. Secondly, he'd already grown comfortable with the United States before signing with the D-backs. The only thing he needed to focus on was his production on the diamond. "I'd come [to the U.S.] a couple times with my family on vacation, and I came a couple other times to play baseball," he said. "The longest I was away from home -- but I was also playing baseball -- was a month or two. We were playing travel ball in Ohio. Those small jumps kind of helped in my transition coming here. Even though [last season] was six, seven months, eight months away from home, I never saw myself getting homesick or not fitting in." The D-backs gave him yet another push, an in-season promotion to Rookie Advanced Missoula in mid-August. He finished the last three weeks of the year in the Pioneer League, not slowing down with a .300/.419/.467 line, three homers and five steals in 17 games. The move up the ladder motivated him even more. "In Missoula, I was ready to jump every time I got on base," he said. "Whether I was full of energy or it was because I never thought I'd make it there [that quickly], I just wanted to go every time I reached base. Looking at my third-base coach hoping to get the sign, that was something I was really determined about." With that successful first pro campaign under his belt, Robinson -- ranked the No. 5 prospect in the D-backs system -- has been in Arizona for the last month, preparing for 2019. In part, he returned to the Southwest so early because he couldn't find a proper baseball setting in the Bahamas to ramp things up. He did, of course, make sure to participate in the Don't Blink Home Run Derby, representing Team Fox in a new format. His development so far has keyed on working with D-backs outfield coordinator Jonny Gomes, who was Robinson's hitting coach in the AZL. With his speed, he's a fit for center field, where he made 35 of his 52 starts last season. But given his size and age, it's still a possibility he might be too big for center and will be moved to a corner. Robinson has shown the bat to make either left or right work, though even he recognizes he'll have to improve on a 26.2 percent strikeout rate to make the most out of his hit tool as he ascends the D-backs chain. The strategy to tackle that issue is, as of now, turning up the velocity on the pitching machines to 96 mph for batting practice, allowing Robinson to see heat on a consistent basis -- something that didn't happen much in the Bahamas, but sure will in the upper Minors. Arizona has yet to convey to Robinson the organizational plan for his 2019. Class A Short Season Hillsboro would be the next logical stop, but he's shown repeatedly that he's capable of tackling tough assignments, meaning a move to Class A Kane County has to be at least on the table. Another big spring followed by another big summer would put Robinson on the map, potentially as a Top-100 prospect right alongside No. 60 Chisholm. That would be getting ahead of himself, but then again, getting ahead of himself has been the 18-year-old's specialty dating back to that day by the bay when he almost outslugged one of the game's premier young talents. "I'm just trying to grow as much as I can," Robinson said. "Sometimes I have to tell myself that there's no limits. If I have a lot of things to do, a lot of things in a day, I want to make sure I get all of them done. That's true outside baseball too. I take it into my workplace, my baseball career. I don't want to hold back on anything. I don't want to get ahead of myself, but I'm also not trying to make any excuses for myself this year."